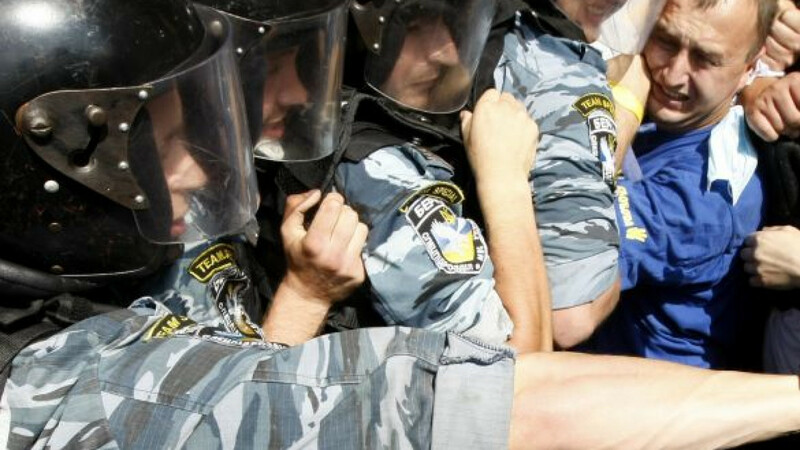 Ukrainians clashed with police Wednesday, a day after a bill that would place Russian on par with Ukrainian as the official language of 13 of the nation's 27 regions was quickly pushed through parliament. Hundreds of protesters gathered outside a government building in Kiev where Ukrainian President Viktor Yanukovych was expected to give a news conference that was then reportedly canceled. Demonstrators hurled bottles and sticks at the police, and both sides used pepper spray, reports said. Police also used tear gas to disperse the crowd. Yanukovych is expected to soon sign the bill into law, allowing Russian to be used in courts, schools and other state institutions in the selected regions, mostly in the nation's east. Ukrainian would remain the only national language. Opponents say the bill would push Ukraine away from the West and closer to Russia, as well as dissuade millions of Russian-speaking Ukrainians from learning and speaking the national tongue. Verkhovna Rada Speaker Volodymyr Lytvyn insisted that the vote was illegitimate and announced his resignation Wednesday. His deputy, Mykola Tomenko, also stepped down, the parliament's website said. Tomenko is a close ally of the imprisoned former prime minister, Yulia Tymoshenko. Seven national lawmakers declared they would go on hunger strike, Russian media reported. In Lviv, a western region, activists blocked entrances to the regional government building and called for long-term protests, Interfax reported. Politicians pledged to block roads and railways if the bill is not scrapped. Supporters attest that the bill would benefit speakers of many minority languages, not only Russian, because it would give official status to any language spoken by 10 percent of a region's population. Thus, Hungarian would become an official language in the Zakarpattia region, Romanian in the Chernivtsi region, and Crimean Tatar in Crimea. Passing such a law would be in line with European principles, not Russian demands, said Iosif Diskin, a member of Russia's Public Chamber. "Yanukovych took a neutral European way to deal with it, but it is not the way that satisfies the Russian side. It shows that he moves toward Europe," he said. Kremlin chief of staff Sergei Ivanov welcomed the Ukrainian bill shortly after its approval Tuesday. "I think that it will do good not only for Ukraine but also for its citizens, its people," he said, Interfax reported. Russia has long called for Ukraine to give Russian official status as a national language. Vyacheslav Nikonov, head of the Russky Mir state-funded foundation, which promotes Russian abroad, said the bill is compromising but "a step forward." "This is not a perfect solution that would resolve the whole problem," said Nikonov, who is also a State Duma deputy with United Russia. "But it is a step forward that gives Ukraine's Russian-speaking regions some support." Sergei Obukhov, a Duma deputy with the Communist Party, agreed, calling the bill "one-legged." "We and the Communist Party of Ukraine want it to be the national language because it is a crime to ignore 40 percent of the population," he said by phone. The bill has many problems, but it is a landmark event because it provides leverage in the fight for the Russian language, said Konstantin Zatulin, head of the Institute of CIS countries. Zatulin suspected that the measure was designed to boost Yanukovych's Party of the Regions ahead of parliamentary elections in October. "I'd say there will be more things like this," he said. 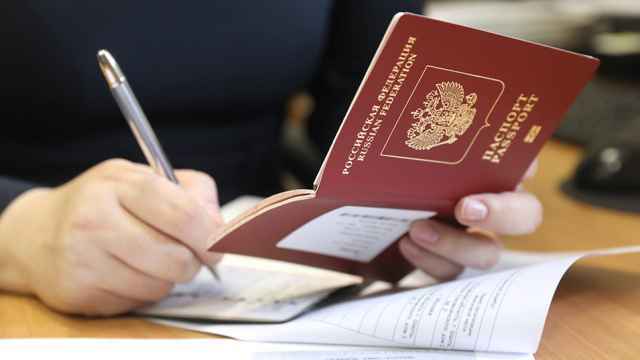 If the bill becomes law, Russian would become an official language in the Dnipropetrovsk, Donetsk, Zaporizhia, Luhansk, Mykolaiv, Odessa, Sumy, Kharkiv, Kherson and Chernihiv regions, the autonomous republic of Crimea and the independent cities of Kiev and Sevastopol. Putin signed the decree on the day that Ukraine officially declared Volodymyr Zelenskiy the winner of its presidential election. The fires, which were swept in from Mongolia by high winds, have caused almost $9.4 million in damage. State energy giant Rosneft had threatened to ban the news agency from Russia. Each of the two warships “represent 100,000 tons of international diplomacy,” the U.S. ambassador to Russia said.